It has hardly escaped the attention of anyone living in Iceland of late, that the Canadian geothermal company, Magma Energy, recently bought Geysir Green Energy´s (another geothermal energy company) stock in HS Orka (southwest-peninsula power company), making Magma a majority stockholder with 98,5% partnership. Magma´s purchase of GGE´s stock comes as no surprise whereas it´s been clear from the onset that Magma intended to claim majority ownership over HS Orka. Ross Beaty, CEO of Magma Energy, has repeatedly been asked if he´s exploiting Iceland´s economic turmoil to claim control over the country´s resources, which he has always denied. 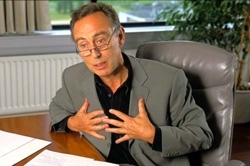 On the 26th of August last year when he appeared on Kastljós, an ‘after-news special’ program on RUV (Icelandic National Broadcasting Association), Beaty also denied being interested in more power plants. “No, we´re focusing on this now. This is a small nation and it doesn´t serve our purposes to become to big”. Because of exactly these comments, the announcement that HS Orka had sought permission to do test drilling in Hrunamannaafrétti, from Flúðir and into Kerlingarfjöll in search of geothermal areas garnered a considerate ammount of attention. Keep in mind that a research permission is not a permission to raise a power plant, but still, just drilling one test hole can cause a considerate ammount of damage on pristine land. 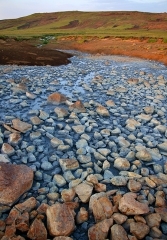 Then, just a few days later, RUV news reported that Suðurorka, an energy company owned by HS Orka and The Icelandic Power Company (a consulting company), has plans of building a dam in Skaftárhreppur, the 150 MW Búlandsdam, over the next four years. HS Orka seems therefore to be on the warpath. Let’s cut to the chase. The opacity of Icelandic business and politics has done the country, as a whole, no favours. Much hand shaking and back scratching has gone on behind closed doors and such secluded business environments have proved themselves to be breeding grounds for lies, corruption, fraud, swindling, and downright thievery. With Icelandic bankers being held in local prisons and wanted by Interpol and the once celebrated “outvasion Vikings” having their pants sued off by the Americans, now is a time to usher in a new, honest era of business in Iceland in an effort to get the country and its economy back on track and to restore the trust of the mass populace in the system. This item, written by Paul Nikolov, originally appeared on grapevine.is, a news site which has been following this case from last summer. The Canadian energy company Magma Energy will soon own 98% of HS Orka, an Icelandic power company. Leftist-Green MP Ögmundur Jónasson believes the government ought to step in and prevent the sale from happening. In a nutshell, Magma Energy already owns 46% of HS Orka, a measure approved by the conservative-led city council last autumn. 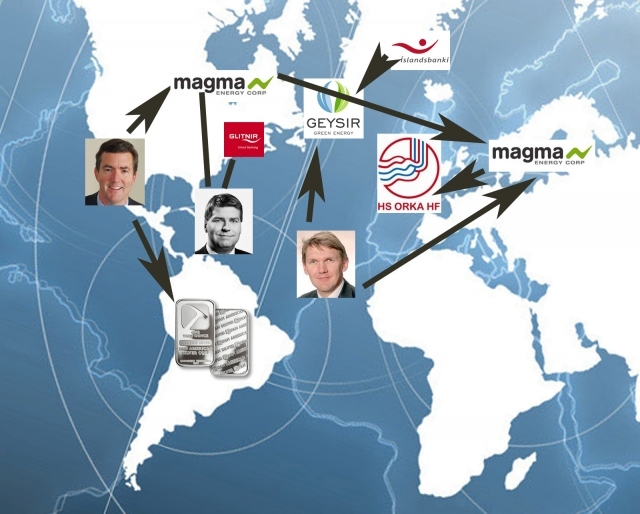 Now Magma is set to buy Icelandic energy comapny Geysir Green Energy’s 52% stake in HS Orka. This effectively puts Iceland’s third largest power company in the hands of a foreign company, with very few returns remaining in the country. The professional environmental saboteur, Friðrik Sophusson, former president of Landsvirkjun (Icelandic National Energy Company) and before that the financial minister under the Independent Party’s reign of terror, has now become head of the board of directors of Íslandsbanki, one of the government owned banks since the collapse of the bank system in 2008. The bank is now mostly in the hands of it’s creditors and the board of directors, which has been expanded to 7 members, are now mostly foreign experts in the financial sector. Íslandsbanki also owns majority in the geothermal energy company Geysir Green Energy and controls all of it’s board members. 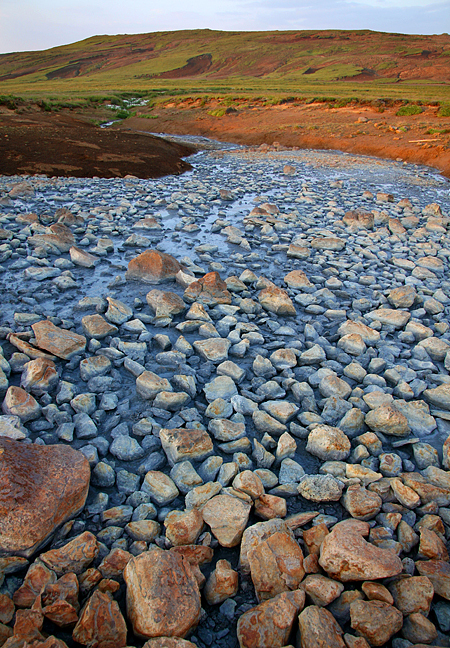 Geysir Green Energy, in return, owns a majority stake in HS Orka (Southern Peninsula Geothermal Energy Company), or 57,4% stock after acquiring 34% stock from the municipality of Reykjanes Town and selling 8,6% to the Canadian Magma Energy Corp. So Sophussons years in meddling with Icelands resources and energy companies are obviously far from over, and now he’s got his dirty fingers down in the money jar as well, where he can apply the needed pressure on these companies, owned by his bank, to further his dream of a totally harnessed Iceland. From The Reykjavík Grapevine, by Catharine Fulton – One by one men in suits of varying shades of grey approached the podium in the pit of the Reykjavík City Hall. One by one they pleaded their cases while Reykjavík’s esteemed mayor—the fourth in two years—Ms. Hanna Birna Kristjánsdóttir looked on appearing disinterested in what appeared to be solely a formality. 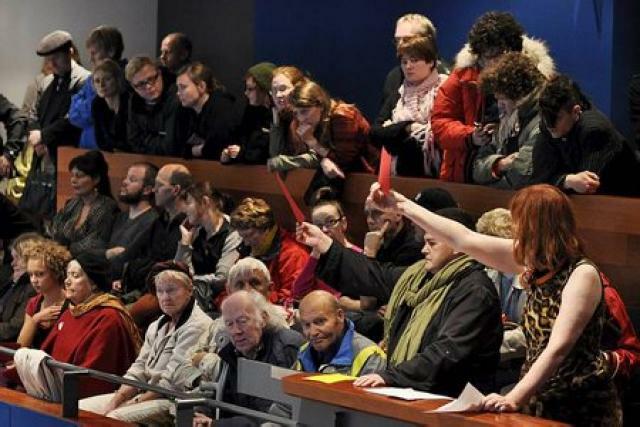 As the council members continued selling the idea of selling Iceland’s resources, a crowd of 100-strong grew more agitated and increasingly vocal from their perch in the viewing gallery of the hall, separated from having a say in their own natural resources by an aesthetically pleasing glass barrier. Read the beginning of this story by clicking here – Yesterday, the Reykjavík City Council approved Reykjavík Energy’s (O.R.) contract about the company’s selling of their share in H.S. Orka. The share has been purchased by a Canadian geothermal company, Magma Energy, owned by Ross Beaty, a former owner of copper and silver mines companies in Latin America. O.R.’s share was 32% but Magma Energy had already bought 11% in H.S. 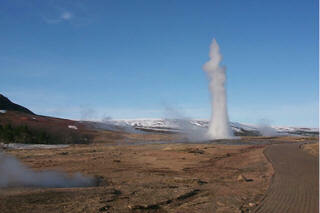 Orka from Geysir Green Energy (GGE) and therefor owns 43% in the company. Recently, GGE bought the majority share in H.S. 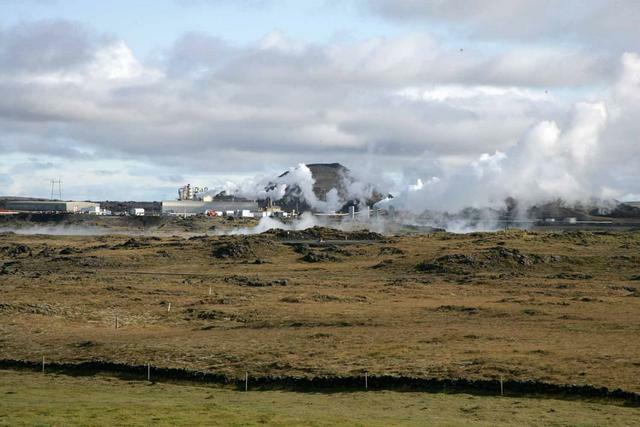 Orka from Reykjanesbær council, which means that the access to geothermal energy in the Reykjanes peninsula is now mainly in the hands of private companies. Magma and GGE have already announced ideas of the companies’ unification.